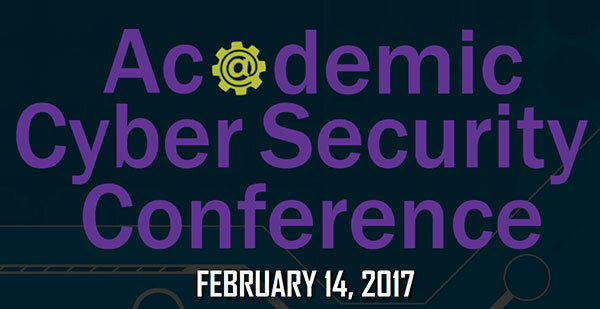 Middle Georgia State University's School of Information Technology is hosting its first Cybersecurity Conference, featuring experts on key issues in cybersecurity, on Tuesday, Feb. 14. This daylong event, to be held in the banquet hall of Middle Georgia State's Professional Sciences and Conference Center on the Macon Campus, is free and open to the public. is liaison officer to the National Cyber Investigative Joint Task Force and has been the lead or support agent to multiple high profile intrusion and espionage investigations requiring a cyber expertise. Topics to be discussed with various speakers include cybersecurity issues in the banking industry, protecting healthcare records, fighting ISIS and dealing with Internet threats. The conference, co-sponsored by MGA's Knowledge@Work program, will last from 8:15 a.m. to approximately 6 p.m. on Tuesday, Feb. 14. Participants may bring their lunches or buy lunch in the MGA cafeteria. To register, visit http://www.mga.edu/cyberconference2017. For more information, contact Dr. Scott Spangler, MGA assistant professor of Information Technology, at scott.spangler@mga.edu. A Macon Campus map and directions are at http://www.mga.edu/about/maps.aspx. • Dr. Philip Craiger, professor in the School of Engineering Technology at Daytona State College, which is designated as a National Center of Digital Forensics Academic Excellence by the Defense Cyber Crime Center Academic Cyber Curriculum Alliance. • Dr. Chris Nelson, distinguished visiting professor in the Department of Economics and Geosciences, at the United States Air Force Academy. • Dr. Karen Paullet, who teaches cybersecurity at Robert Morris University. In addition, Paullet has spent more than 13 years working with law enforcement preparing cases for trial using digital evidence. • Capt. Mark Rives, U.S. Public Health Service, is the chief information officer and director of the Office of Information for the Indian Health Service. Rives is responsible for advising senior IHS leadership on all aspects of information resource management and technology and ensures compliance with information technology laws, regulations and policies. systems management, vendor management, data conversions and technology migration. • Michael Boston, who has more than three decades of experience in military, business and academia. Boston serves as chairman of the Board of Trustees of The Asymmetric Studies Institute, a partner with the Department of Military Science at The Johns Hopkins University.